I believe I have improved the starting, running, and maintenance situation on the 1970 Rover 2000 TC I use for daily transportation. I changed the points and condenser ignition system to an electronic device. I read a discussion on the RoverNet about the "Pertronix" electronic ignition and did some Internet research. It seemed to be a recommended system. I found the factory web site in California http://pertronix.com. From there, I determined the telephone and fax numbers as they don't appear to have an email opportunity. Fax number: (909) 599-6424. Telephone number: (909) 599-5955. Upon returning home, I began the replacement. I checked the timing statically by turning the crank and having the original points open at the position I use (about 2 – 3 degrees BTDC). Following the written instructions in the box, I disconnected the battery (actually removed it for better access). 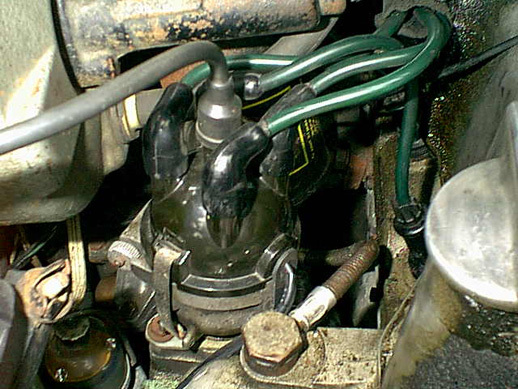 I removed the distributor cap and rotor and put them aside. I removed the two screws holding the ignition points and condenser plate. I lifted the plate and the "pigtail" away from the distributor and put them aside. I carefully pried the module clear of its backing plate (EIBP). I positioned the EIBP over the holes with the original brass pin sticking through a drilled hole provided. I opened the sealed plastic package and removed the countersunk screw and the round-headed screw needed to secure the EIBP to the distributor. I lowered the ignition module unto the screw studs on the EIBP and used the two nuts provided to secure it. The next step is to position the magnetic pick-up over the distributor spindle so that the squared sides and the round hole match. I ensured a "snap fit" as required. I led the two wires (black and red) around the spindle. Pertronix provides a black rubber grommet to replace the "pigtail" so I fitted that in place and led the wires outside the distributor. I was now ready to replace the rotor in the original correct position. 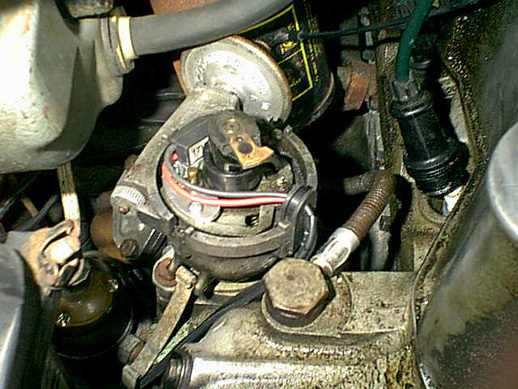 I replaced the distributor cap and HT wires. I replaced the coil I had in place with the Pertronix version (It was cheaper than a coil I had bought some months previously so the price was right.). I led the red wire to the positive terminal on the coil. I have a tachometer so I had to depart from the connection they suggested (black wire onto negative terminal of the coil). The white/black wire, which had been attached to the pigtail on the distributor, was folded back up one side of the coil. I used a strip of metal to join the female connector on the black wire from the distributor to the female connector on the white/black wire, which used to lead to the pigtail. I pushed the connections down beside the coil. I got into the car, turned the ignition, and ……. the car started first time. I adjusted the timing, idle speed, and mixture and proceeded for a road test. My route was along the highway at maximum speed and then up Cypress Mountain before returning home. The car started immediately and performed as I expected. The Pertronix electronic ignition worked for me! My points and condensers can be saved for my Collector car because that need has been removed from my daily driver. Later in the week (Friday, July 12), I set out for Lytton in convoy with Malcolm Tait on a work party to increase the number of shelves in the Club Parts Shed and to sort the goods. The car with the electronic ignition ("ROVERS") started first thing in the morning and I proceeded up the highway at a generous 100 km/h. The car turned off without pre-igniting when Malcolm and I stopped for coffee part way there. It started instantly. The temperature for the day varied between 25 and 30 degrees C for the trip. In fact, it raced around the bends of the Fraser Canyon and climbed "Porlock Hill" without trouble. We breezed onto the Heaster's property with Malcolm and his trailer following. The car returned home rapidly and in a hot environment. The electronic ignition seems to work for me.